Rowan Yarns are my absolute favorites, hands down, no contest. It's been that way since I discovered them back in the late 1980s. One day, I'd like to take a trip to England to visit Rowan "in person", and take a class, any class, while I'm there, just to be there. The picture was scanned from an old photogrsph and it turned out slightly blurry for some unknown reason. 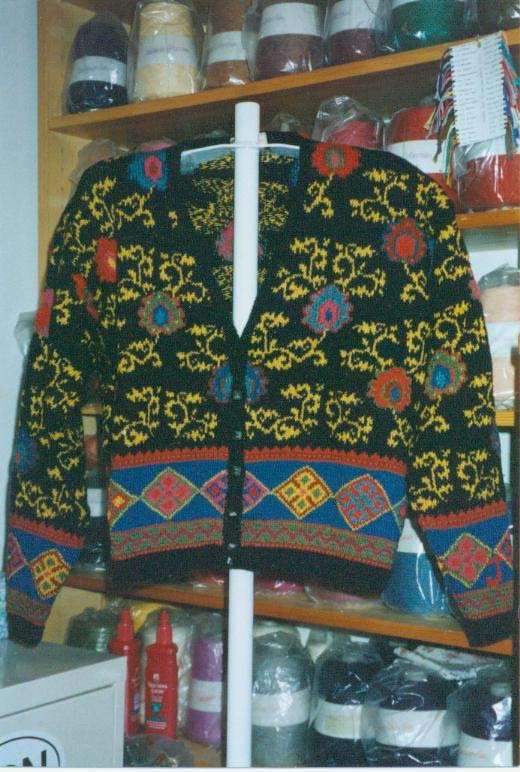 I made this cardigan in the 1990s exactly the way the pattern was written. The yarns are all Rowan: Wool/cotton (black), Mercerised Cotton (gold scrolls), Sea Breeze and Cotton Glace. The only problem yarn was the mercerised cotton because it is a circular yarn and it was a bit difficult to weave in the ends. Otherwise, I really enjoyed the challenge and liked the results. The techniques were a combination of intarsia and stranding. Each of the gold scrolls was treated as a separate little stranded section, so each scroll is both intarsia and stranding. Everything else was intarsia, and yes, I do like the technique a lot! I wear this sweater to this day and I still love it as much as I did more than a decade ago. 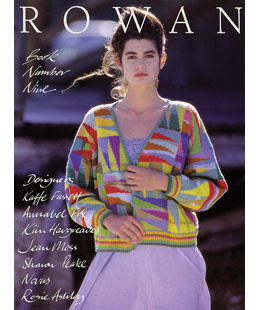 Update: I just had a look at the Rowan website and they have some free patterns from their magazines, including Tuscany. You can get the pattern by clicking HERE.